In my position as Manager, Lactation Services at Baystate Medical Center in Springfield, MA, I’m expected to keep the department running efficiently, prove the economics of our efforts and, of course, educate and provide resources for new and expectant parents. This is a challenging task! 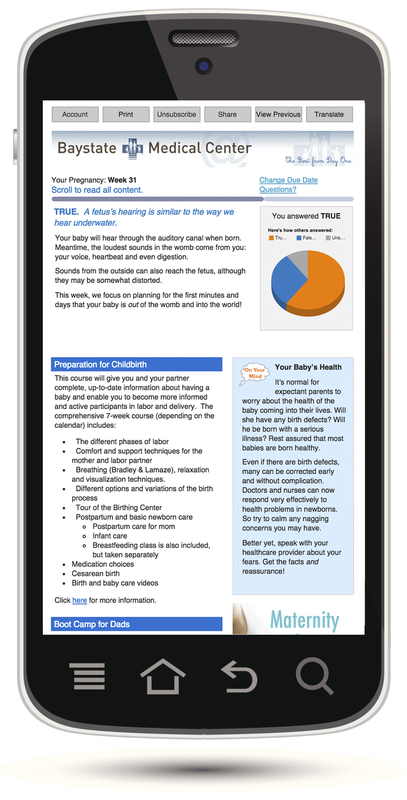 In the past year that I have held my position and Baystate Medical Center’s nine years of using UbiCare’s SmarteXp patient engagement solution for Pregnancy and Early Childhood, we’ve learned the value—both figuratively and literally—of connecting with our patients digitally through educational messages that start at the beginning of pregnancy and continue through the child’s third birthday. First, there is the intangible value of providing health education resources to new moms and their families—helping the entire family feel involved in the birth of a child—and building a relationship between our hospital and these new parents and families in the process. Then there is the real, tangible value that we can see on paper. 1.) Use the full range of capabilities of your patient engagement solution. The SmarteXp Pregnancy and Early Childhood messaging series includes 4 years of evidence-based health content. These messages are sent to parents and families automatically, based on the baby’s due date. While it’s tempting to let all that wonderful automation work on its own and not deal with it any further, a little customization can go a long way toward building a connection between patients and your hospital. It can also immediately demonstrate a return on your investment. Recently, we decided to add reminders about several classes we offer to expectant moms (Baby Magic Birthing Class) and dads (Daddy Boot Camp) to our messaging series. Our goal was to let more of our pregnant population know about and thus drive enrollment for these classes, which are held monthly and cost between $20 and $35 each. The results were immediate—and huge! In just 1 month, we saw a 58% increase in enrollment in the Baby Magic Birthing Class and a 50% increase in enrollment in the Daddy Boot Camp class. Knowing that this small amount of customization could drive a 50% or more increase in class enrollment, why wouldn’t you do it? 2.) Automatic, digital communication improves the efficiency of your team. Keep in mind that, in the example above, it took very little effort to customize the messaging series with hospital-specific information. In fact, it took only a few minutes! Long-term, it actually saved my staff time. Previously, my staff had to remember to tell every single pregnant woman they saw about the Baby Magic Birthing Class—on top of all the other important information they needed to tell each woman. It’s certainly possible that an expectant mother would remember to sign up for the class after hearing about it in her medical appointment (although research shows that patients forget 80%–90% of what they learn in the doctor’s office as soon as they walk out the door.) Perhaps she would also remember to tell the child’s father about the Daddy Boot Camp. But that’s an awful lot of finger-crossing on our part! By including details about these classes in our messaging series, we were certain that every expectant mom (and the dads and grandparents who also subscribe) read about the classes and had access to the information right in their email—where they could refer to it at any time. provided a more effective way to tell patients what we wanted them to know. Not only did we increase class revenue by 50%, we also educated 50% more expectant parents about parenting. This helps our expectant moms (and dads) be more confident, more prepared for the best possible outcomes, more satisfied with their experience at our hospital and more likely to return when they or others in their families need care in the future. The impact of our simple customization is far-reaching, but especially in terms of improved ROI and staff efficiency. So far, we’ve seen a big change in just 1 month. I’m excited to see the results as we educate more patients, see more revenue and save staff time over the coming months!